Cat water fountains are an excellent way to persuade your pet to drink more water, which results in health benefits for them, and decreases the risk of certain medical complications caused by dehydration. Cats naturally prefer to drink running water, and can be reluctant to drink standing water from a bowl. This behaviour dates back to the ancestors of today’s domestic cat, when wild cats that drank clean, running water had an advantage over those that sampled standing water (which was generally brackish and contaminated). Many cats don’t like the “chemical” smell of tap water, but a drinking fountain helps remove these. Re-circulating the water through a filter, and with greater exposure to oxygen, means that the smells are dissipated quickly, and your pet can enjoy fresh-tasting, cool, filtered water. 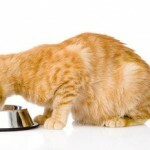 Not drinking enough water can result in your cat becoming dehydrated, especially if they are fed dry food, and this can cause serious health issues, and increase the risk of kidney or urinary tract disease. According to some research, a third of cats over the age of eight years old die as a result of kidney or urinary tract disease. Providing your cat with access to a plentiful supply of clean, running water will encourage them to drink all they need – just as nature intended, and as recommended by vets, and the best way to do this is to provide them with a drinking fountain. 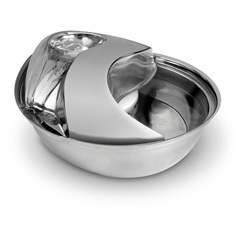 Cat water fountains are available in three different materials; plastic, ceramic and stainless steel. While plastic fountains work well, ceramic and stainless steel fountains are more hygienic as the tough material isn’t susceptible to small scratches like plastic, which allows bacteria to build up that can cause chin acne. They are also generally dishwasher safe too! Another advantage of ceramic drinking fountains like the Lucky-Kitty Ceramic Drinking Fountain is that the heavier material means the fountain is almost impossible for your cat to move or tip over, thus reducing spillage. Drinking fountains can also look good as well – the Pioneer Pet Stainless Steel Drinking Fountain not only provides clean and healthy drinking water, but it looks very stylish too! Some fountains are fitted with a replaceable charcoal filter to keep the flowing water clean, but the range from Lucky-Kitty are designed to not require filters, which cuts down the longer term running costs. Would your cat or dog enjoy having a supply of fresh, clean water at all times? 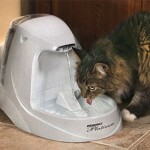 Click to read our reviews of 15 of the best pet drinking fountains for you to buy now! 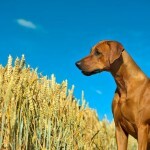 Grain-Free Pet Food – Good or Bad? This entry was updated in Cat, Dog, Health on December 6, 2018 by Ed.